The library now has 14 bikes available for check out. You can now renew many library items online yourself. Don't leave devices in your car in cold weather, especially items with glass screens like iPads, which can crack in cold weather. Print your class roster with photos from Katie. Want your voicemail by email? Use Luther's desktop messaging to send your voicemail messages straight to your email inbox. Follow these instructions to change your Norse Key. You can unsend an email within seconds of sending it by using the "Labs" function within Norse Mail. Use a keyboard shortcut to switch to full screen view: push F11 on a PC. On a Mac, click the full-screen button in the toolbar. When you walk away from your computer, even for a few moments, always lock your machine. Tired of writing the same email response over and over? Check out "Canned responses" in Norse Mail Labs. The Technology Help Desk will never ask for your username or password via email. Use mail merge in Google Drive to send email from Google Docs and Sheets. When buying a new computer, choose dual-band Wi-Fi for the best performance on Luther's wireless network. Remove files that contain sensitive information (including social security number, birthdates, and names) after use. Use a keyboard shortcut to reopen closed tabs in your browser. Want to know if a computer is available in your favorite lab right now? Check out ITS' mobile-friendly Lab Stats site on your phone or tablet. Keep up with the latest ITS happenings, including Finals Week Study Breaks, by visiting www.luther.edu/lis/events. Q1: The library now has 14 bikes available for check out. Thanks to the Luther College Wellness and Sustainability programs, fourteen bikes are available for students to check out any time the library is open. Enjoy the gorgeous fall weather and explore Decorah on two wheels! Q2: You can now renew many library items online yourself. To renew online, go to www.luther.edu/library and click on "Library Account" (under the "Tools" column in the middle of the page). Sign in using your Norsekey ID and password. Click on "My Library Account" in the upper right corner, and click the "Renew" button next to any items you wish to renew. Make a note of your new due date. If you have any questions, call the Circulation Desk at 387-1166 or email [email protected]. Q3: Don't leave devices in your car in cold weather, especially items with glass screens like iPads, which can crack in cold weather. Mobile devices weren't designed to be left out in cold weather. Glass screens can crack, and phones can automatically shut off if it's too cold. Battery performance will deteriorate in cold weather as well. If you have to leave a device in your car, turn it completely off instead of just putting it to sleep — it'll be able to withstand colder temps. For more info and tips on protecting your mobile devices in the cold, click here. Q4: Print your class roster with photos from Katie. Go to the "Course administration" block, then click on "Reports," then "Roster." Choose "Printable" from the drop-down menu, and make sure "Learning mode" is on. Find these instructions in the "Updated Katie 2013FA Features" in "Instructor Need-to-Knows." If you have questions, contact the Technology Help Desk by emailing [email protected] or call 387-1000. Q5: Want your voicemail by email? Use Luther's desktop messaging to send your voicemail messages straight to your email inbox. With CallPilot Desktop Messaging, you can manage all your messages – emails and voice mails – on one single platform (e.g. Norse Mail). You can accomplish this on your PC or on the phone, from just about anywhere (at home, the office, while traveling). Once you have CallPilot Desktop Messaging installed and configured, you can listen to, forward, delete, and save your voicemail messages from a web browser. To get started, complete the CallPilot Desktop Messaging Request Form to make your request. Your account will be activated within 2 business days and you will receive an email when you can set up and use Desktop Messaging. For more information, visit www.luther.edu/helpdesk/desktopmessaging. Q6: Follow these instructions to change your Norse Key. Visit http://norsekey.luther.edu to change your Norse Key. To protect the security of your Norse Mail account, Norse Keys must be changed every 180 days. Faculty, Staff, and Students with a Norse Key will be sent reminder notices in the two weeks prior to the password expiring. If you’ve forgotten your password or lost it, contact the Technology Help Desk by calling 387-1000 or emailing [email protected] A new password can be assigned for you after verification of information. Q7: You can unsend an email within seconds of sending it by using the "Labs" function within Norse Mail. If you've ever wished you could re-write an email after it's already been sent, check out the Labs function in Norse Mail. In your Norse Mail account, click on the drop-down menu by the gear icon in the upper right-hand corner of the screen. Scroll down to "Undo send" or search for it in the search box. Scroll down to the bottom of the page and click "Save changes." Next time you send a message, you may click "Cancel" while the message is in the process of being sent, or "Undo," just after it is sent. Act quickly, because you have a short window of time to unsend the message. Q8: Use a keyboard shortcut to switch to full screen view: push F11 on a PC. On a Mac, click the full-screen button in the toolbar. Keyboard shortcuts are easier and faster than using a mouse. Q9: When you walk away from your computer, even for a few moments, always lock your machine. For PC users, if you need to leave your work area briefly, just hit WinKey+L (WinKey is the key with the Windows logo on it). You could also press Ctrl + Alt + Delete and then click the Lock Computer button. Another way to lock your computer is to press the Start button and then click on the padlock/arrow icon in the lower right corner. You will then be presented with a window that instructs you how to unlock your computer which consists of pressing Ctrl + Alt + Delete and then logging back in. For Mac users, select “Log Out” from the Apple Menu, located in the upper-left corner of the screen. This closes all applications and takes you back to the login window, preventing anyone from tampering with your files while you are gone. Q10: Tired of writing the same email response over and over? Check out "Canned responses" in Norse Mail Labs. Canned Responses is an email for the truly efficient. If you’re getting bored with typing the same reply every time someone emails you with a common question, now you can compose your reply once and save the message text with the Canned responses button. Later, you can open that same message and send it again and again. This is a very useful tool for those who are accustomed to using Templates in Thunderbird. Also, it is possible to send a Canned Response as an action when using email filters. Canned Responses is a Google Labs feature, so you must click on the Labs icon and then enable Canned Responses before it can be accessed. To make a response, type a message and click on Canned responses > Save. Gmail already lets you create filters based on a combination of keywords, sender, recipients, and more in your incoming messages. Turn on Canned Responses in Labs, and you can set a filter to grab one of your saved responses, create an automated reply, and hit the Send button for you. Q11: The Technology Help Desk will never ask for your username or password via email. The Technology Help Desk will never ask for your username or password via email. Any attempt to do so is a phishing scam and should be marked as spam. Phishing is an attempt to access your personal information (username, password, etc.) by luring you with official looking emails or web sites. If you are uncertain about an email you received, contact the Help Desk for verification. Please do not respond to the email or click any links. If you accidentally respond or provide information to a phishing scam, change your Norse Key immediately at www.luther.edu/helpdesk/norsekey. Q12: Use mail merge in Google Drive to send email from Google Docs and Sheets. Using an Add-on from MailChimp, you can send an email to a list of email addresses stored in a Google Sheet. With this add-on, you can insert personalized information from your Google Sheet (including first name, last name, etc.) into the message in your Google Doc. Follow these instructions to get the add-on: Open Google Drive, go into a Google Doc, and choose the Add-ons tab. Select "Get Add-ons" and enter "Merge by MailChimp" in the search box. Click on the "Free" button, and follow the instructions. If you have questions, contact the Technology Help Desk at [email protected] or call 387-1000. Q13: When buying a new computer, choose dual-band Wi-Fi for the best performance on Luther's wireless network. If you’re purchasing a new computer, we recommend that you choose dual-band Wi-Fi for the best performance on Luther’s wireless network. Typically, the base model computer is NOT equipped with dual-band, but there is usually an option to upgrade to dual-band Wi-Fi. This update, which allows the computer to operate in both 2.4Ghz and 5Ghz, is not very expensive (typically in the range of $10 to $30). Choosing this option will improve your experience using the wireless network. Q14: Password protect your smartphone. If your smartphone is lost or stolen, lots of very personal information could potentially be exposed, including email messages, texts, photos, and any social network accounts you leave open on your phone. ITS recommends password protecting your phone to reduce the likelihood that this data could be misused by someone else. Q15: Remove files that contain sensitive information (including social security number, birthdates, and names) after use. To protect your data, remove files that contain sensitive information (including social security number, birthdates, and names) after use. If you need to keep a file that contains sensitive information, password protect the file. Q16: Use a keyboard shortcut to reopen closed tabs in your browser. Keyboard shortcuts are easier and faster than using your mouse. To reopen closed tabs in your browser, click CTRL + shift + T.
On a Mac, use the Command key in place of the CTRL key. Q17: Want to know if a computer is available in your favorite lab right now? Check out ITS' mobile-friendly Lab Stats site on your phone or tablet. Visit http://labstats.luther.edu/mobile/home.aspx to see how many machines are available in each computer lab on campus. 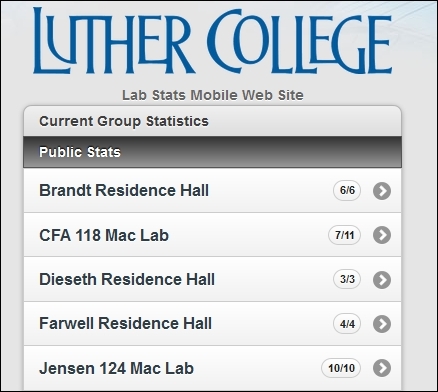 For complete Lab Stats info, including lab schedules and usage percentages, visit http://labstats.luther.edu. You can also visit www.facebook.com/PreusLibrary for the latest on events, giveaways, and general library happenings. Read training and instructional articles. Technology Help Desk maintained by Diane Gossman. Page last updated on 6 November 2017.